Somewhere around the age of five years old, many of us learn that another way to identify water is by the molecular name, H2O. This usually leads to more questions like: ‘What is H?’, ‘What is O?’, ‘How does that make water?’, ‘Why should I care?’. Over the years, we grow into more advanced chemistry students exploring topics like compound formulas, and we learn that the world we live in is made up of complex associations of combined atoms. A chemical compound is a substance that is composed of two or more chemical elements. The reason that we should care about compounds is that an element such as Oxygen (O) can be very different if it is associated with Hydrogen into H2O to make water, or as SiO2, which is Silicon Dioxide that makes up sand on a beach, or as Fe2O3, which is ferric oxide, loosely known as rust on steel. 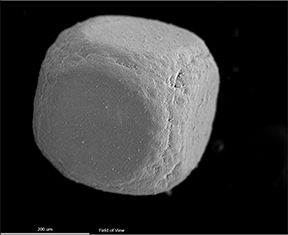 Therefore, as microanalysts, we should pay close attention to compounds because the elements alone do not always tell us the complete nature of the material we’re analyzing. Once we grow into an “expert scientist,”* we become deeply entrenched in the details of microanalysis, and we often forget to take a step back to see the big picture. 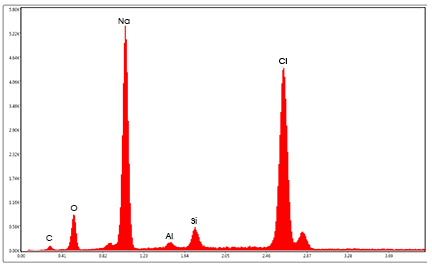 For example, as an EDS analyst, I look at the spectrum below and I think “what a nice sodium peak” or “hmm, am I picking up Al due to scatter at variable pressure?” But unless I’m using it for an introduction to a microscopy and microanalysis student lecture I don’t often simply call it what it is, and that is NaCl, or salt. Next, we look at the electron image at very low mag and that gives us a better contextual understanding that it is a grain of salt. When we look back at the spectrum again with a big picture view, we recognize that the main elements present in the spectrum are Na and Cl, and that they make up the compound NaCl, or salt. In follow up to my recent webinar, I received a lot of questions asking “What are CompoMaps?” and “How can I use CompoMaps?” I was glad to see so much interest in such a valuable routine, and I do hope that users of every level can use this “Compound” view to understand their materials more deeply. To answer the first question, “CompoMaps” is a sophisticated software routine that creates a display of the elemental composition of each pixel. That is, the intensity of the pixel display color is a direct representation of the peak intensity of an element. It is helpful when there is a trace amount of an element, because the routine separates the peak from the background, removing the noise and intensifying the signal. It is perhaps most useful for separating element peaks where there is ambiguity whether there is one element, or another. In the example shown below, I was collecting this data when I happened to get a chance to web connect with an earth sciences professor. After he saw the before and after, he commented that the “after” made much more sense because those two elements would not likely be in combination together in any mineral. 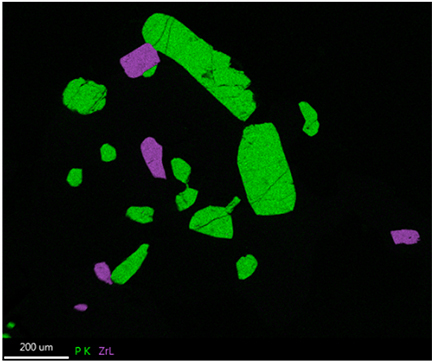 The results here show that Phosphorus in green and Zirconium in purple are definitely located in two different phases. The display shows both with (right) and without (left) the Phosphorus and Zirconium superimposed, and this gives us a better understanding about the compound, since Oxygen is present with these elements. After full investigation of all element maps, we find that the two phases are Ca5(PO4)3F, or fluorapatite and ZrSiO4, or Zircon. Finally, the answer to the question, “How can I use CompoMaps?”, is easy. This is a routine that EDAX has had in all of our software packages from Genesis to TEAM™ (as Net Maps) and now in APEX™. The routine has been optimized for APEX™ with 64-bit architecture and advanced processing capability, along with an easy to use workflow for results in live-time. So, give it a try and see what you can find! *My personal opinion is that we should never let ourselves call ourselves experts, lest we forget that there is always something new to learn.